I'm reposting this in honor of tomorrow's book birthday of David Lubar's Extremities. He wrote about Extremities' long road to publication on his web site and this tied right into what he was saying. Story collections are becoming more popular. Is it because readers, accustomed to quick reads on the net, are wanting their stories in smaller bites? Do they want to get in and out of a story in small time segments. I'm finding it a welcome trend because access to short stories has been much harder in the past few years as magazines stopped publishing short fiction and so many magazines stopped publishing. Short stories have a long tradition in Speculative Fiction so it is no surprise that the new story collections I found both fall into that broad genre. I'm not going to talk about anthologies, collections of stories by different authors, right now but there have also been some that are great reads in the last year. 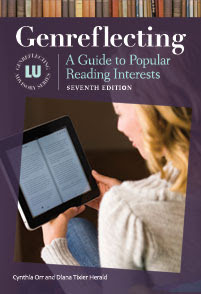 One of the characteristics of story collections is that readers will usually find some stories they connect to and others that don't make as much of an impression. The interesting thing is, that because reading is a creative endeavor shared by writer and reader, no two people ever experience a story in the same way. Different readers will like different stories. For his week of my reading plan, I read two different collections, both speculative fiction, by authors I have always enjoyed. 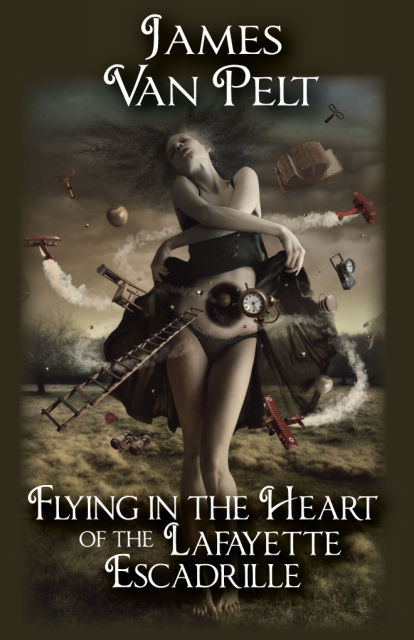 Flying in the Heart of the Lafayette Escadrille by James Van Pelt is for adults and mature teens. Extremities is published for teens. 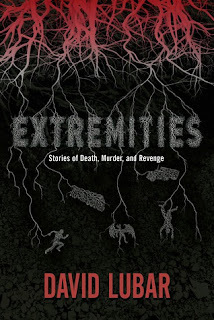 David Lubar, author of the Weenies series of short story collections for middle grade children, is the author of Extremities: Tales of Death Murder, and Revenge a collection of thirteen creepy stories perfect for the slightly older middle school audience. He also injects his punning humor, particularly in the story "Split Decision." Some of the stories are period pieces complete with video stores and cassettes. "Whoodoo" a short short flash fiction type, as well as several of the other stories have an urban legend feel. The final tale, "Evil Twin" is extremely memorable, (I had a nightmare after reading it) a fitting wrap up to the collection that will have readers wanting more. 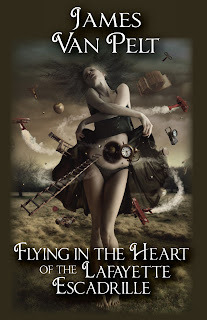 Flying in the Heart of the Lafayette Escadrille is the fourth collection by James Van Pelt who has often been a finalist for major SF awards and is way past due. In my opinion he is one of the best if not the best writer of speculative fiction short stories writing today. This book was a procrastiread for me. I rationed myself to one story a day from it. Stories include range from science fiction, to horror, and fantasy. Fewer stories in this collection featured teachers than I remember from his other collections but his stories that do deal with students, teachers, and school are compelling. I really enjoyed the short short story, “Just Before Recess” in which a boy finds a sun in his desk and a grouchy teacher gets what may be his just rewards. “O Tannenbaum” combines the story of Christmas during World War I when the soldiers from both sides joined in a brief cessation of hostilities to celebrate the day but the protagonist is a young man whose life is lived on a very different scale that that of others. A couple of the stories are told from an alien point of view, “Working the Moon Circuit” is set in a tourist destination on the moon where the tourists don human bodies to experience it as a human. “Plant Life” is a truly creepy tale of fruit, fully responsive and grown in the shape of a woman, to be used for a short time. “One in a Thousand” is truly horrifying as a man dreams of deaths, night after night, and when he is away discovers that the people who died in his dreams, die, too, in the waking world. Very Twilight Zone! “Mrs. Hatcher’s Evaluation” is also terrifying but in a completely different way. It is about a terrific teacher who actually teaches in a way that students learn but is not playing the political game our schools are currently immersed in, so is on the figurative chopping block. “Ark Ascension” is set in an ark, orbiting the earth in a last ditch effort to save life as we know it after species on earth experience disaster mutagens resulted in a “catastrophic species shift.” So many more wonderful, scary, thought provoking stories. Definitely worth reading.